I didn’t really know how to title this post. It’s not that I’m anti-Kindle or (insert other e-book device here) it’s just that I’m pro-books. Actual books. The smell (from sharp new academic texts, to fusty old, mouldy ones) the feel of the paper, the design of the cover, the choice of typeface; cannot be beaten. Growing up, my love for the library was so great that when everyone else wanted to play dress up as doctors or super heroes, I pretended to be a librarian. I used to stamp my books before loaning them out and kept a fiercely updated list of who had taken which book. 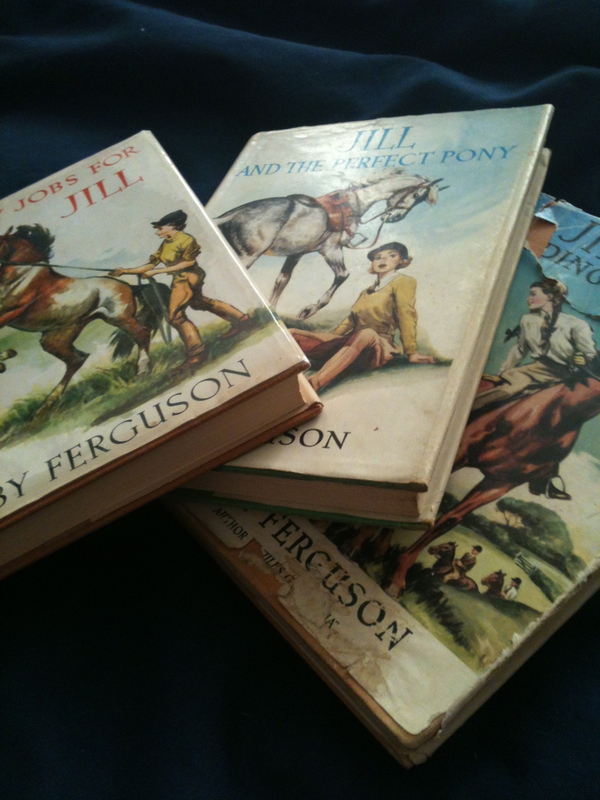 My favourite books were pony books, and as a grown-up, I collect first editions of the ‘Jill’ series by Ruby Ferguson; my ultimate rose-tinted memory of that period. In contrast to this, I recently enjoyed a completely new experience. My first Twitter book-club discussion, run by the lovely people at @More_Than_A. It was lovely to chat through a recent shared read (One Day, by David Mitchell) and hear other people’s views on such a popular book. A great discussion was had and it felt like a lovely way to share the love of reading and meet some new people online. I am already looking forward to the next one! Although I still pay a couple of visits each week to the library, I have indulged in my love of books through the mighty Amazon. Like so many of us, I find the combination of choice and discounts irresistible – which, unfortunately has resulted in something of an overwhelming stack of books waiting to be read. My ‘to read’ list is 85 books long, and that doesn’t include books I’ve borrowed from people or non-fiction books which I bought as reference/I’d like to do that someday-type of thing. Probably the number is closer to 100! I still have the Jill books from childhood, but tracking down the older editions is really fun – although frustrating, as there are very few in decent condition around. I have heard of a 2012 Challenge, for people to only read the books they already have – have a look at Leeds Book Club blog, I’m sure it was on there…might be something for both of us to think about!! I love reading books, whether on the Kindle or in print. And I still buy loads of actual books, new and old, even though I have a Kindle. Much the same as I still buy CDs and records, even though I have an iPod. And it’s funny that you should mention ‘One Day’. I’m intending to write a blogpost called ‘One Day, four formats’ soon. I love that you used to pretend to be a librarian! Such an important part of my childhood, the ritual of the little cards and the stamps. Although I appreciate that technology holds many advances, I do miss that. I look forward to reading your post about One Day. I liked it, but don’t really believe it to be one of the defining books of my generation. I find it just so very risky going into a bookshop, I end up leaving with bulging bags…. I tend to buy most things online, no toddler tantrum in the isles, no stuff that they want and I don’t. The same goes for books, easy browsing and no pain online. Apart form old books, charity shop here I come. Dump the kids in the kids books corner with a quid each…. I love books but I also really love my Kindle! It’s a different way of reading but because it’s bit easy to flip back or ahead I find I concentrate much more when reading and get a richer experience as a result. I also love going to bookshops and having a good browse. Books are my comfort blanket when things aren’t as sunny as I’d like I find a book that is for cheer and hope. It’s really interesting that you say the Kindle makes you concentrate more – I’ve never really thought of that. What has been really interesting is that everyone I’ve spoken to who loves their Kindle isn’t going to give up real books any time soon – so there is clearly a place for both of them!